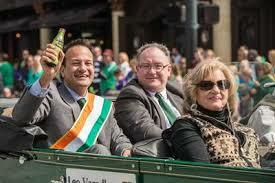 Up Up and Away, Taoiseach and Ministers to fly out for St. Patrick’s Day celebrations abroad. The announcement comes just as Dail is resuming after long Christmas break. Oireachtas out again for Easter. Varadkar the Taoiseach and ministers are to take off for St. Patrick’s Day celebrations across the world. The announcement has come just as the Dail is getting back after the long Christmas break. The Oireachtas will be closing again for Easter. Listed to travel for the St. Patrick’s Day festivities are Varadkar, Ring, Humphreys, Stanton, D’Arcy and Attorney General Wolfe, all destined for the United States. Naughton and O’Donovan (Patrick) will spend St. Patrick’s Day in Canada. Joe McHugh is down for a visit to Brazil, Donohoe is going to Argentina, Moran, Kenya, Griffin, USA and Mexico, Kehoe, Lebanon and Cyprus, while housing Minister Murphy is to take in Korea and Japan. Coveney is to leave for China and Hong Kong, Daly, Australia and New Zealand, Flanagan Australia, Mary O’Connor UAE and Oman, Doyle, Vietnam and Phelan, Singapore. Dail chairman O’Fearghail is included for Croatia, Senate Chairman O’Donavan (Denis) Slovenia & Bosnia Herzegovina, McEntee, Austria and Slovakia, Kyne, Switzerland, Byrne, Denmark and Finland, Cannon, Czech Republic, and English, Poland. Harris is set to travel to the Netherlands and Belgium, Bruton, Germany, Madigan, Norway and Sweden, Zappone, Italy, Doherty, France, Creed and Halligan, UK, and Breen, Scotland. Ross is remaining in Ireland. It’s reckoned visits to date have cost taxpayers around a million euro. Members of local councils are also set to travel for the Patrick’s Day celebrations abroad. Meanwhile, thousands of families in Ireland are left without homes; children are being crammed into temporary accommodation, closure of commercial outlets in the North West is at record levels, businesses locally are struggling, and jobs are as scarce as hen’s teeth. An existing Sligo manufacturing outfit has reportedly announced plans to create 33 jobs annually over the next three years, however, government assistance to the development of new industrial infrastructure is virtually non-existent. Despite the presence of no fewer than four TDs in the Sligo-Leitrim constituency, “delivery” for the area is light on the ground. The four TDs are Martin Kenny, Sinn Fein, Fianna Fail spokesman on business and employment, Eamon Scanlon, the party’s Sligo-based TD Marc MacSharry and Fine Gael TD and party’s assistant whip Tony McLoughlin. Some companies are said to be planning on leaving the North West, further slashing the availability of employment in the area. Fianna Fail has committed to backing the Government, and to not bringing it down in confidence motions or objecting to reshuffles.